An amazingly tender Mediterranean flavoured oven baked stuffed sea bass recipe for the lovers of the Greek cuisine! 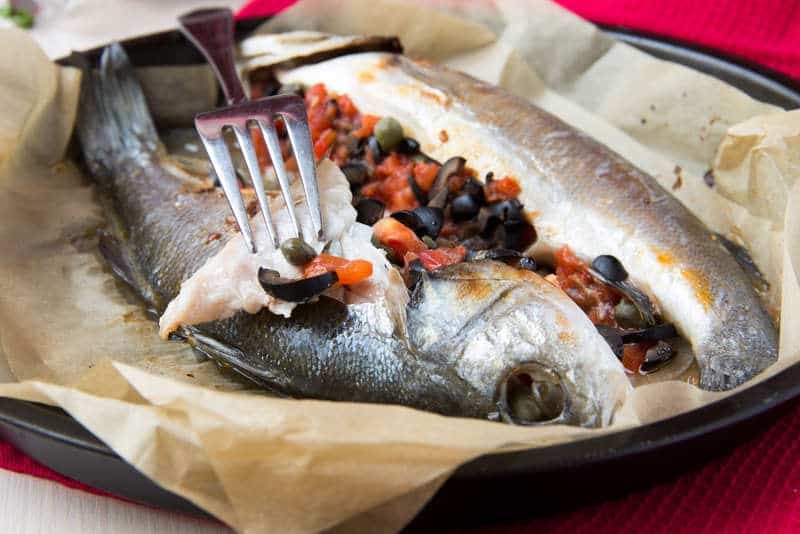 To prepare this delicious baked stuffed sea bass recipe the fish is filled with lemon slices, chopped fennel, tomatoes, capers and kalamata olives. Then drizzled with olive oil, scaterred with fresh parsley and baked in a delicious dry white wine sauce to form an impressive 30-minute vegetarian dish! Prepare this baked stuffed sea bass recipe with fresh medium-sized sea bass, leaving the heads and tails on for extra flavour. For a perfectly cooked tender baked stuffed sea bass the key is to use some foil or foil bag to wrap the fish in order to seal the flavors and smells. Pour in some good quality white wine and let the fish bake in the steams, to keep all the juices and aromas inside. Bake everything wrapped in aluminium foil, until all of the flavours have been released and the stuffed sea bass is simmering in all the delicious juices, until tender.. Once the stuffed sea bass is baked, let it rest for a while still covered with the foil. Enjoy this Mediterranean flavoured baked sea bass with some steamed vegetables or crisp green salad aside. Prepare the stuffing for the sea bass. Finely slice the fennel, lemon and tomato and set aside. Peel and finely chop the garlic and slice the kalamata olives into rings. Fill the cavity of each fish with 2 slices of lemon, the fennel and half the amount of the chopped tomato, olives and capers. Scatter on top of the sea bass the chopped garlic, any remaining fennel slices and the rest of the olives, tomato and capers. Pour in the white wine and season with salt and freshly ground pepper. Drizzle the sea bass with olive oil and garnish with chopped parsley. To bake the stuffed sea bass, you need to seal the fish well by folding the foil up like a parcel. This will help keep the juices and flavours in and will help your stuffed sea bass maintain tender. Bake the stuffed sea bass in preheated oven at 190C for 20-25 minutes, until cooked through. Remove the baking tray from the oven and let it rest for 3-4 minutes, then place the stuffed sea bass with the foil on a serving platter, unwrap carefully, garnish with some lemon zest and enjoy! you will need to slice the fish open from the head to tail and stuff on the inside. No need to spread it open completely, just open the cavity up to stuff with the filling, as the fish is served whole. Vegetarians don’t eat fish. This recipe shouldn’t be in the vegetarian section.